There are times when there won’t be even a single vegetable in my fridge. Or when there is no dal, rice or cereal in my pantry. But there will never ever be a time when I am out of eggs, flour and butter. It’s a panic situation if it comes to that. In fact, just thinking about it is stressing me out! So when we had an impromptu get together, all I had at home was the “crazy dough” in the fridge and some eggs. Crazy dough got used up as pizza and these went in along with it. I used the same veggies that went in the pizza and used up the cheese from there as well. And we named them “eggizza”. 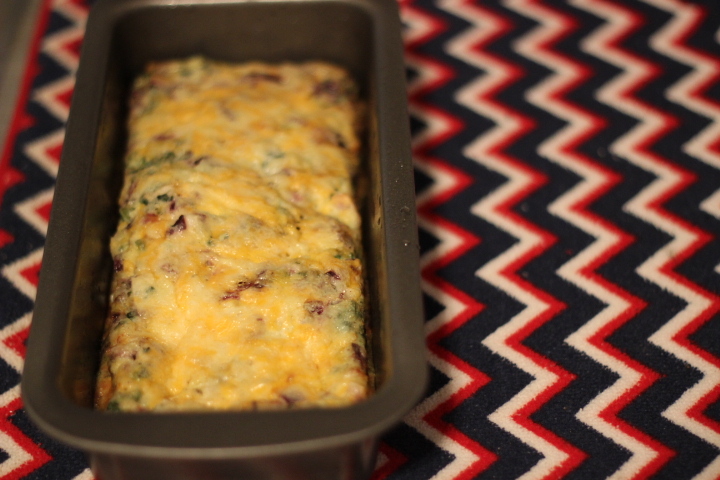 Because we wanted a fancier name than quiche. I made these again, a week later. This time I used some spinach and corn. And I was able to click some hurried pictures too. 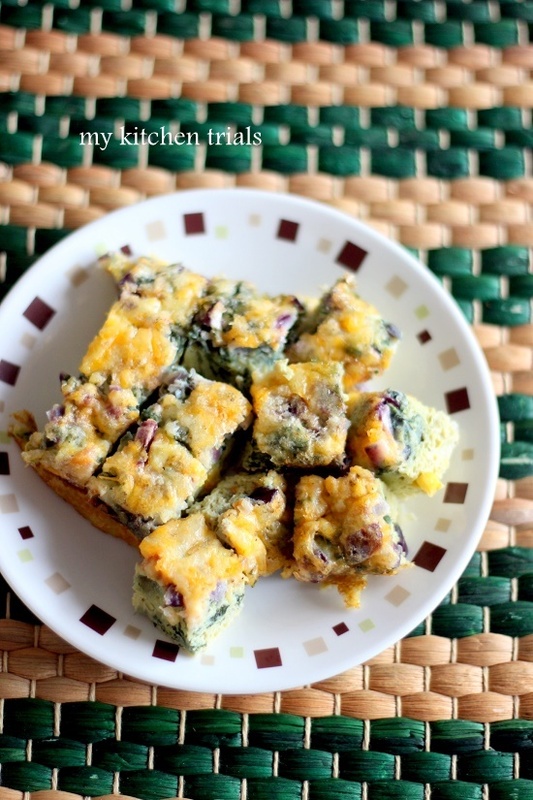 So make these, bake these, use anything you have in your vegetable tray and savor these!! 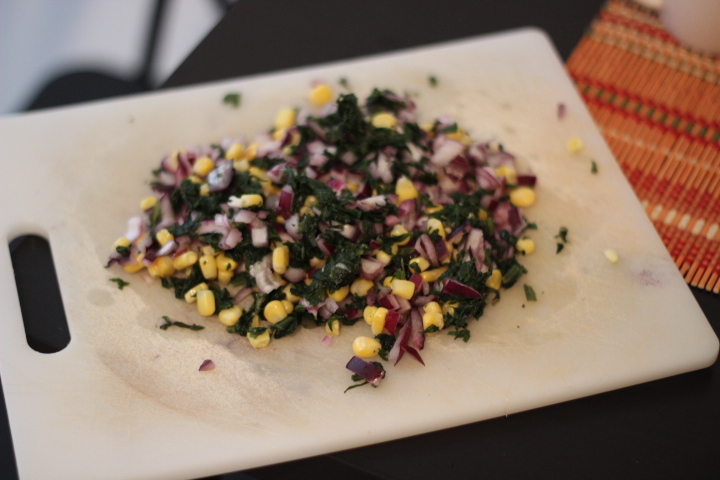 Chop the onion finely and add the thawed spinach and corn. 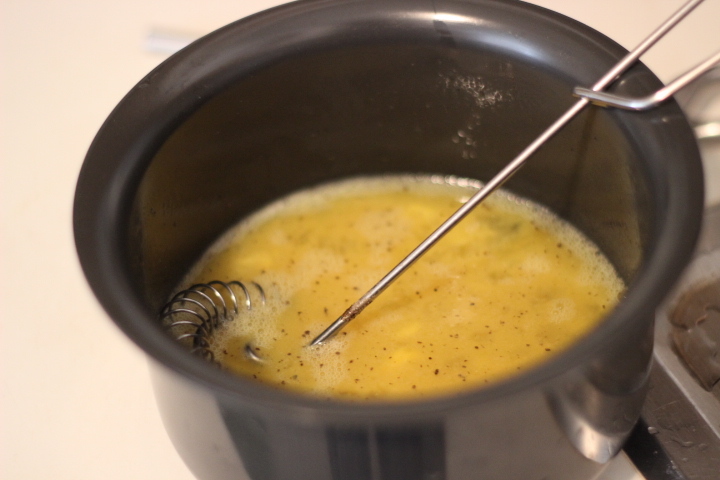 Pour a layer of the egg mix to cover the base of a greased pan. Add the vegetables on top. Add rest of the egg mix over it. Sprinkle cheese/ bread crumbs on top. You can skip this layer also. Bake for about 30 minutes or until the top is set and doesn’t jiggle and its cooked in the center. 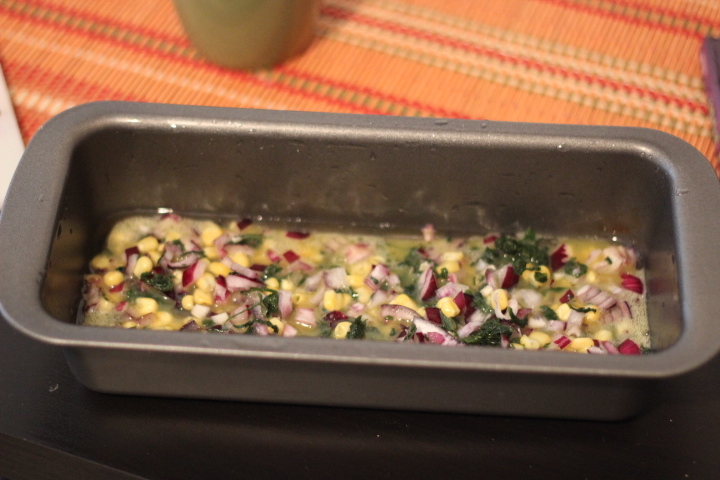 Veggies of your choice: I used 1 onion, handful of corn, two handful spinach (I used frozen). Bell peppers, tomatoes, olives, mushrooms all are good choices. Preheat the oven to 180 C/ 350 F. Grease a muffin pan or a loaf pan. Its a good idea to line the pan with parchment paper or use paper cups for easy cleaning of the pan. Chop the vegetables into fine pieces. Beat the eggs with salt and pepper in a separate bowl. Pour a layer of the seasoned egg mix into the greased pan. Add the vegetables on top of the egg layer. Add the rest of the egg mix and sprinkle cheese or bread crumbs on top, if using. Bake for around 30 minutes or until the eggs are set and cooked in the centre. DO NOT overfill the pan. The egg puffs up a lot when cooking, so it might overflow. 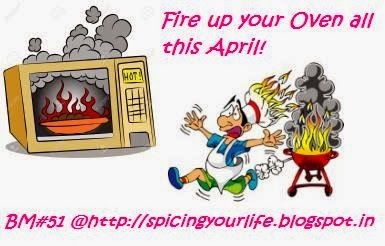 The eggs puff up and then fall down once its out of the oven. These freeze well, so its a make ahead dish. 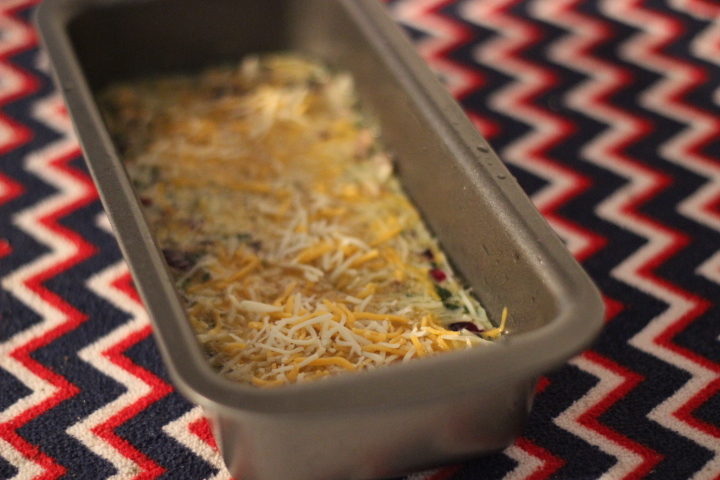 Kind of like a frittata in a loaf pan. Healthy and filling. 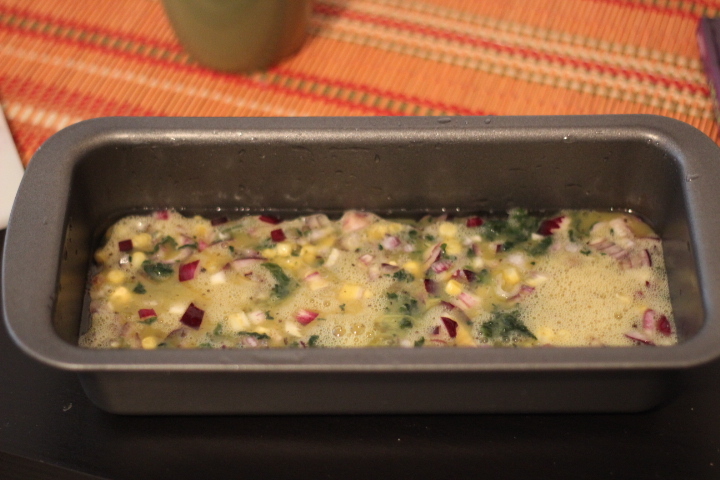 Wow, love this baked quiche in a loaf pan. Looks so yummy. I think my pizza & egg loving folks would love this. Wow, i can finish have eggizza rite now for my lunch.. Just a fabulous dish. Good one for the egg lovers. 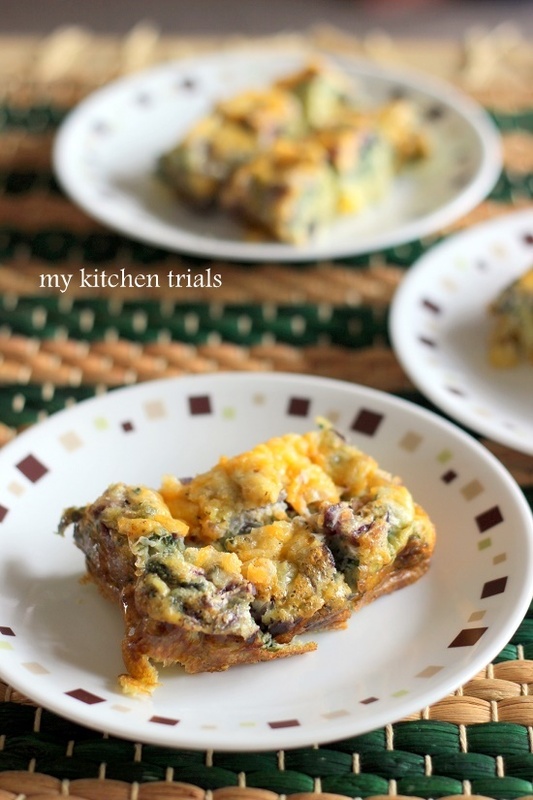 great recipe for egg lovers!!! A great one pot dish. Interesting recipe for egg lovers like me,never tried this way..will try it soon. Oh I thought you had baked this over the pizza dough..:)..this looks very inviting too..
delicious treat for egg lovers! !